Stunning, elegant and unique - three words that will come to mind when your guests see this vase! Crafted from hand-blown glass, our Personalized Affinity Vase has a curved silhouette and statuesque presence. 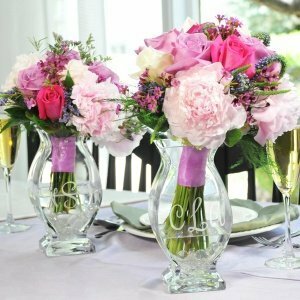 The vase measures 8" by 4" (at the widest point) with a 3 1/4" wide opening, and can be personalized with your choice of a single script initial or a 3-letter script monogram. Whether you place this vase at the altar or your head table, it will make a bold and beautiful statement. Note: Vase is crafted from hand-blown glass, which may contain small bubbles. 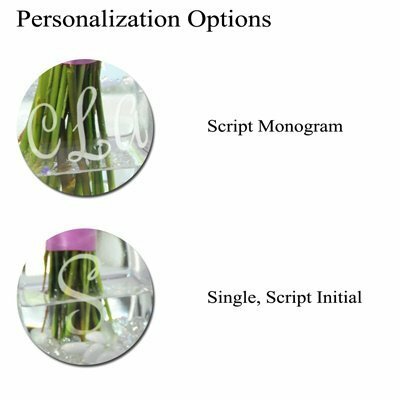 Note - This item includes a personalization, color, size or design option: Single Initial or 3 Letter Monogram (e.g., Initial or Monogram (Enter Monogram as First, Last, Middle)) (max of 3 characters) (Free of charge). You may specify this information during our checkout process.